Mathematics, English, Economics, Commerce and Management are the favourite subjects of admission seekers in Maharshi Dayanand University whereas subjects like Fine Arts, Music etc have very few takers. The brilliant students, seeking admission, believe that in the era of privatisation and globalisation , the highest demand in the job market is for Economics, Commerce, Management, English and Mathematics. There is also demand for related subjects like Geography and Psychology. Interestingly, nearly 70 per cent of the candidates seeking admission in the English Department are girl students. They feel that a postgraduate degree in English will be useful in getting better marriage proposals, besides extending good employment opportunities as lecturers at the school level. There is also enthusiasm among the admission seekers for science subjects like Chemistry and Physics. Most of the applicants for science subjects also prefer teaching job after acquiring the degree. There are 627 candidates for 90 seats in the English Department and 525 for 90 seats in the Mathematics Department. For 30 seats in the Geography Department, 280 candidates have submitted applications. Similarly, 88 candidates have sought admission against 24 seats in the Psychology Department and 135 for 60 seats in Economics and 266 for 100 seats in Commerce departments. Surprisingly, there are few applicants for Fine Arts. The department has, till the last date of submission of admission forms, received only eight applications against the 10 seats. The department has four teachers. The department is not sure whether all the applicants would be willing to seek admission in the end. Similarly, the Department of Music has four teachers and has received 19 admission forms for 20 seats. The Department of Statistics, too, has not many applicants. Against the 20 seats, the department has received only 16 applications. The Department of Operation Research, created in the Statistics Department in 1993, has interestingly received not a single application. Because of the poor response of admission seekers to the Fine Arts and Music departments, the Perspective Plan Committee, a high power committee comprising the Deans and members of the Executive Council, last year had recommended that the unviable departments should either be closed or merged. The committee, headed by Dr S. B. Dahiya, Dean, Faculty of Social Sciences, had also suggested the merger of the Public Administration Department with the Political Science Department, the Statistic Department with the Mathematics Department and the Rural Development Department with the Economics Department. The university has, from the current academic session, only merged the Rural Development with the Economics Department. Although southern Haryana has provided valiant soldiers to the Indian defence forces and boast of the highest number of serving and former servicemen, there are few takers for the Defence Studies course introduced by the university about five years ago. Against the 20 seats in the Defence Studies Department, there are merely six applicants. Thus the provision of holding entrance test for admission to this department has become irrelevant. With the first cut-off list of various colleges coming out, Delhi University now gears up for the admission process of Kashmiri migrants that will commence on July 5 and continue till July 12 (10 am to 1 pm). Like the letter (dated June 11. 2001) from Maharaj Krishen Kaw, then Secretary (Secondary and Higher Education), sent to almost all educational institutions of India to grant certain concessions to the wards of Kashmiri migrants during the academic session 2001-02, this year too, the Government of India has formally requested Delhi University for relaxing the admission norms for candidates under this category for the academic year 2002-03, as the situation has not improved in Jammu and Kashmir. “Since the time the situation in Kashmir worsened, Delhi University has provided some provisions for the Kashmiri applicants on the request of the Indian Government. The admission procedure of Kashmiri applicants usually starts after the announcement of the second cut-off list as the colleges can accommodate them only after this,” said Dr Hema Raghavan, Dean, Student Welfare, Delhi University. “To ascertain the identity of Kashmiri migrants, they have to come with their educational certificates, documents related to their property, service etc of the parents,” she added. The concessions include extension in the date of admission by about 30 days, relaxation in cut-off percentage up to 10 per cent subject to the minimum eligibility requirement, increase in intake capacity up to five per cent, course-wise reservation of at least one seat in the merit quota in technical/ professional institutions, waiving of domicile requirements and facilitation of migrants in second and subsequent years. The notification for the allotment of courses and colleges will be announced on July 19 at 10 am and the provisional admission slip will be issued on July 22. Meanwhile, the SC/ST candidates can heave a sigh of relief as Delhi University might come out with a second phase of registration for such candidates after July 8. “Unlike last year’s three phases of registration for SC/ST candidates, there will only be two phases this year as the number of candidates has increased. It can only be decided after the admission list for such candidates that will be put up on June 29 and July 4,” said Dr Raghavan. THE Punjabi Academy, Delhi, organised a two-day fest called 'Rangmanch Utsav' at the Shriram Centre for Art and Culture on June 20 and 21. This fest involved young kids from different areas around Delhi enchanting the audience with their theatrical skills. The Punjabi Academy has been organising such events for the past 12-13 years with an aim of nurturing young talents and teaching the kids something substantial during their vacations. The fiesta had an impressive array of plays for viewing, written by well-known writers like Vijay Tendulkar, A. Chekhov, Jeetendra Sharma and Anis Azmi. The inaugural evening had the Principal of Khalsa College as the chief guest and the kids were encouraged by the presence of theatre personality Aneesh. The first play was performed by children from Geeta Colony, Jheel, under the direction of Gurdeep Sehra. Their play, titled 'Pasina- Pasina', has been written by Vijay Tendulkar. The play was an attempt to make people aware of the importance of working and earning a living for our own self rather than just sitting idle and doing nothing. It was a sarcastic comment on the present trend in our society where people are afraid of working hard and look for an easy way out of every problem. The whole concept was given a thought-provoking treatment by the young actors and actresses accompanied by some very melodious tunes. For the entire 45 minutes till the play reached its finale, the entire audience was kept spellbound by the children with their enthusiastic performance. The second play of the day, written by Anees Azmi and directed by Veena Sidhu Taneja, was titled 'Lapata Sipahi'. It was performed by children from Rohini and was equally impressive. The other two plays that were performed on the 21st were 'Bal Sena', written and directed by Jeetendra Sharma and performed by children from Ashok Vihar. The second one was 'Ek Duniya Rang Birangi', written by Chekhov and directed by Dr Nira Sehgal. It was enacted by children from Raghuvir Nagar. The entire fiesta was a remarkable one, which showcased and brought into notice some very talented and upcoming artists. They were given an opportunity to learn something good and made to develop an interest in the astounding field of theatre. The Punjabi Academy is performing a commendable job indeed. Special guest Lady Bhusina Volcova, the Slovak Republic's Ambassador's wife, graced the evening with her presence. She was deeply impressed by the children and their amazing performance in spite of the language barrier. She declared they were better than Bollywood actors. The person behind the show was Captain Indraani Singh, Founder Secretary of Literacy India and also a pilot with the Indian Airlines. She has the distinction of being Asia's first woman commander and has dedicated her entire spare time passionately to welfare work for children. 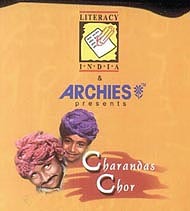 The play was based on a Rajasthani folktale that also goes by the name of 'Charandas Chor'. It provided the children with an opportunity to look into a different world, where they can explore and learn about different characters, absorb them completely and then portray them. Their innocent and raw talent provided an altogether different touch to the entire play. Be it the young hawaldar, who was at his best and easily the most comic character of the play, or the thief himself, the children vowed the audience with their performance. These kids, who belong to the low strata of society, never let that feeling come to the audience's mind. There was hardly any dull moment during the entire evening, as everyone was kept glued to their seats by these budding stars. “The Crusade” is the first novel written by Chitra Mudgal. The book is a journey into the life of a woman struggling to make a place for herself in the 'bad' glamorous world of advertising. The novel narrates how she tries to save herself from the evils surrounding her and make a decent standing for herself. 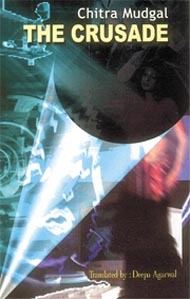 The book raises questions related to the rights of a woman. Whether they, even the educated ones, have been able to comprehend what those rights are? Have they been able to define the parameters according to which they will live and survive in this male dominated society? The book draws the reader into a dialogue concerning the status of women and their identity in this ever changing world. It is a very heartwarming story which forces the reader to look within himself and makes one think hard about the situations in which the protagonist finds herself caught and the questions raised by them. A must-read for all young and upcoming girls blossoming into women. It is priced at Rs 350 and has been published by Ocean Books. FENG Shui is here to stay. This ancient Chinese art, which uses the environment to influence the quality of human life, is definitely giving stiff competition to home-spun practice of 'Vaastu'. There has been a tremendous increase in its followers and practitioners. One young consultant of this art is 21-year-old Aishwarya Nagpal, who runs an exclusive Feng Shui outlet called 'Rare Earth' at Lado Sarai. Wind chime - It neutralizes energy in its surroundings. The material it is made of and the direction where it is placed matter. They are not to be placed in the bedroom, kitchen and the toilet. They enhance good luck and suppress bad luck in the afflicted area. If there is any structural problem, it is used as an antidote. If the chime is made of metal, it is to be placed in the west or the north west part of the premises. If it is made of bamboo, it is to be placed in the east or the south east. The ceramic one to be placed in the south west or the north east. Phoenix bird - It is used for opportunity and luck and also to strengthen the harmony & unity in the family. For opportunity, it is placed in the south sector of the living room. For love and harmony, it is placed in the south west part. Peony flower - Used for enhancing marriage prospects of the daughters in the house. To be placed in the south-west sector of the living room or the bedroom. Married couples should not use it or there is danger of a third person coming between them. Eternal bamboo - These are placed for longevity and prosperity. To be put in the south east or the eastern sphere of the living room, dining room or the office. Should never be placed in the toilet or bedroom. Six crystal balls placed together in a crystal bowl enhances business luck and network luck. To be placed in the northwest sector of the work desk or the living room. Dragon head tortoise with baby tortoise on its back - Used for enhancing luck and as an antidote to backstabbing and politicking. To be placed in the workplace behind the person or in the living room in the southeast direction. Crystal globe - Augurs well for education opportunities for students and for travel luck overseas. For education, to be placed on the study table in the northeast sector and to be twirled once a day in the clockwise direction by the student. For travel luck, to be placed on the work desk or in the living room in the northwest sector and to be twirled thrice a day in the clockwise direction. Dragon head fish - Placed for academic and scholastic success either in the north east of the living room or above the main entrance door from inside. Tortoise - For career enhancement and longevity. To be placed in the north sector of the table or any room. For longevity, place in the east sector of the living room or bedroom. Three Chinese deities: Luk, Fuk & Fall - For good health, happiness and abundance. Placed in dining room facing the dining table at a good height above three feet. These objects not only add beauty to our living and work spaces, but one can also make use of their mystic powers, if placed in the right spot.